It is coming as a surprise to many that NASA’s robotic explorers, the Opportunity and Curiosity rovers, could not observe the shooting stars phenomenon that occurred recently when a comet that zipped past Mars spawned thousands of planetary dust known as shooting stars in the Martian atmosphere. The burning dust created streaks of light across the Martian that particular night, and the specks should understandably have been observed by NASA’s robotic rovers – but the unmanned spacecraft never caught any piece of the action. The Maven orbiter was deployed to analyze the shooting stars or sprayed dust in the Martian atmosphere, and they were found to contain sodium, potassium, manganese, nickel, chromium, and zinc. 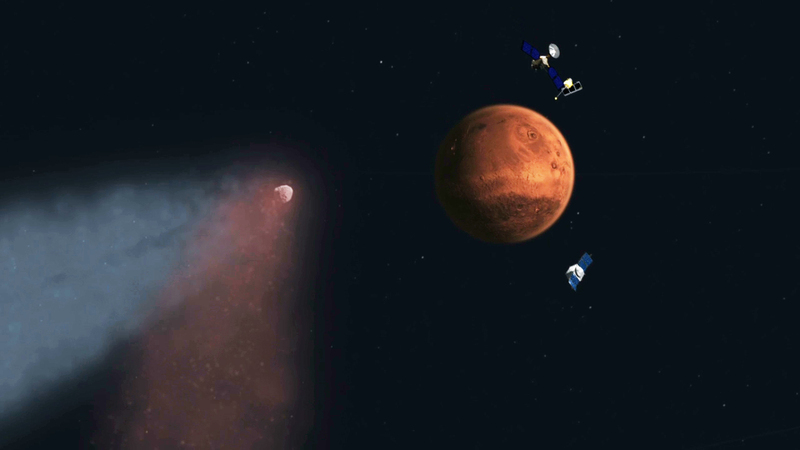 And while NASA and ESA orbiters were moved away from the path of the sprayed dust to opposite sides of Mars when the spawning comet arrived, scientists believe any small amount of the fine particles could have damaged or even destroyed the spacecrafts. To conserve power they are designed for single shot photos with fixed moderately slow shutter speed. Not lots of memory for storing lots of frames for movie either. Thus not suitable for the unpredictable time and short length of meteor streak in atmosphere. And you couldn’t transmit a movie at slow data rates either. But maybe software could be modified to accumulate something similar to long exposure photos using 2-3 photo frames to build overlaid record of what many snaps saw.